Whether for a Wedding, Baby Shower, Housewarming Party – or Other Special Moment – Customers Can Create a “Wish List” Choosing from Thousands of Affordable Products for Every Area of the Home. IKEA Registry - Image Credit IKEA U.S. The new IKEA Gift Registry makes it easy for your loved ones to help you celebrate your special moments, whether it’s your wedding day, a new baby, an exciting move—or just any other reason to shower you with love. IKEA U.S. announces today a new gift registry which allows customers to create and fulfill wish lists for weddings, baby showers, housewarmings, back to college, or any other special occasion. Whether seeking cozy bedding, the perfect set of wine glasses, a new crib or even a new kitchen, shoppers can easily choose their favorites from thousands of affordable products for every area of the home to add to their registry. To celebrate the new registry, IKEA is offering the chance for three registry entrants to win a $1,000 IKEA gift card to use for their special moment (giveaway period is 2/14/17 – 5/31/17). * IKEA will also offer registrants additional giveaways, prizes – and other surprises! – on an ongoing basis. 3) Go to an IKEA store and use the IKEA Gift Registry kiosk. The IKEA Gift Registry is powered by IKEA FAMILY, so to create a registry, shoppers must be a registered IKEA FAMILY member** (simply log in using an existing account, or sign up for IKEA FAMILY – the free IKEA loyalty program – when creating the registry account). Adding items to a registry list is easy. When in-store, the IKEA Gift Registry app can be used to scan product barcodes, manually enter article numbers or to capture and add entire room settings (multiple products) using the special “snap photo” function. The “snap photo function” also allows shoppers to add IKEA services - like home delivery or delivery with assembly - to their list. On the IKEA Gift Registry website, shoppers can add products by entering their article numbers or by searching/choosing from a categorized product list. Registrants can also select product suggestions from the inspiration section, as the website features gift ideas for any occasion, from weddings to baby basics to new home needs. Additionally, users can add items to their list directly from the IKEA website product pages (http://www.IKEA-USA.com). Once completed, the registry list can be shared with guests via text message, email or social media. Users can manage their registries online or on-the-go with their mobile device and can follow what friends and family have purchased, read messages from guests and to send thank you notes. 2) Add to Gift Card: Via the IKEA Gift Registry site, users can virtually “buy” an item; the value is then applied to an IKEA Gift Card, as opposed to buying the physical product. 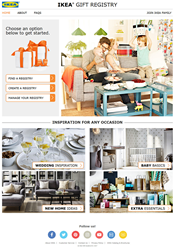 For more information on the new IKEA Gift Registry, visit http://www.IKEA-USA.com/registry. To download the IKEA Gift Registry app, visit the app store (iOS and Android) or text “REGISTRY” to 62345 to get a link to download the app. To celebrate the new registry, IKEA is offering the chance for three registry entrants to win a $1,000 IKEA gift card to use for their special moment (giveaway period is 2/14/17 – 5/31/17). * To enter, customers must create an IKEA registry between February 14, 2017 and May 31, 2017. No purchase necessary. For official rules and additional information about the “IKEA Gift Registry Giveaway,” visit http://www.IKEA-USA.com/registry. IKEA will also offer registrants additional giveaways, prizes - and other surprises! – on an ongoing basis. *The Giveaway begins at 12:00:01 AM (ET) on 2/14/2017 and ends at 11:59:59 PM (ET) on 5/31/2017. Visit http://www.IKEA-USA.com/registry for Giveaway rules. **IKEA FAMILY is a free loyalty program with benefits such as product discounts, free coffee or hot tea in the restaurant, 90 day price protection, extra Småland time, special offers, ideas and inspiration, and more. Visit HERE for more information. ****Not all IKEA products are available to purchase online. To find out if a product is available to purchase online, when looking at the registry list online on the IKEA Gift Registry website, click on “purchase” to reveal the purchase options for a specific item. Adding the registry number in the shopping cart during the online checkout process will ensure the purchase is attributed to registry. To do this, enter the registry number in the “IKEA FAMILY card number” field in the shopping cart at checkout. *****Present a gift registry print out or pull up and present the registry number and barcode via a mobile device to the cashier at checkout. The cashier will scan the registry barcode at the register. If the product has a special IKEA FAMILY price, it will be applied once the barcode is scanned as well. Since its 1943 founding in Sweden, IKEA has offered home furnishings of good design and function at low prices so the majority of people can afford them. There are currently more than 392 IKEA stores in 48 countries, including 43 in the U.S. IKEA incorporates sustainability into day-to-day business and supports initiatives that benefit children and the environment. For more information see IKEA-USA.com, @IKEAUSANews, @IKEAUSA or IKEAUSA on Facebook, YouTube, Instagram and Pinterest.